R.H. Lindsay (Linsley), last surviving member of William P. Russell, Post GAR, was buried in Middlebury on Tuesday with full soldier honors. Mr. Lindsay had died at Bellows Falls early Sunday morning. Funeral services were held from his late home in that village on Tuesday morning and the remains brought to Middlebury for burial. Services were held here at the grave. Mr. Lindsay had lived in Weybridge for many years and had been an active member of the GAR Post in Middlebury. His home was at the end of Seymour street just beyond the Pulp Mill bridge. Some years ago he began spending his winters with his step-sister in Bellows Falls and for the past three years has made his year around home at that place. The deceased was a native of the town of Ripton. He was born in 1846. He received his early education in the schools there. Later he lived in Manchester and then came to Middlebury. When the civil strife between the states broke out Mr. Lindsay volunteered for the Union army. He was wounded twice in action, once at the battle of the Wilderness and once at the battle of Petersburg. Besides his step sister with whom he made his home, Bertha Lindsay, of Bellows Falls, he is survived by two brothers, Charles and James, of Alstead Center, N.H. and one daughter, Faith Lindsay, who is a teacher in the Barre High School. The American Legion Post members of Middlebury and Spanish War Veterans turned out to pay homage to the memory of the last survivor of the Civil War at the time of his burial here on Tuesday." 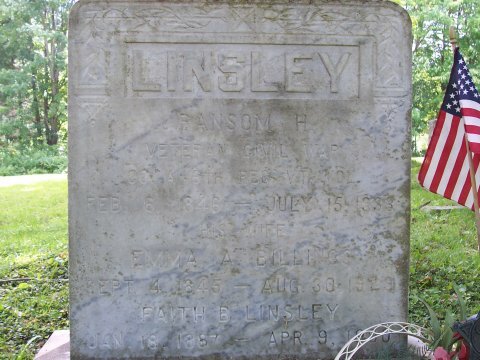 MILITARY RECORD: LINSLEY, RANSOM H., credited to Middlebury; enlisted 6 Feb 1864; date of muster 6 Feb 1864; promoted Corporal, 1 Nov 1864; wounded and taken prisoner 5 May 1864, paroled, date unknown; wounded 2 April 1865; mustered out 7 Jun 1865. Source: July 20, 1933 Middlebury Register, Middlebury, Vt.; Revised Roster, p. 185. Contributed by Mary Ann Brown, who now owns Linsley's home in Weybridge.